After an interruption of sixteen years, a year ago I resumed scratching on film, a technique that had been at the center of my work for so many years from the mid seventies on. I did not want to simply carry on doing the samething I was doing before I stopped, so I decided for an evolving process in order to frame ina new way my return to this technique. The project developped through a series of phases from the Spring of 2016 to the Fall of 2018 : 30 gif’s scratched on 16mm film and published Facebook, Scratch (Triptych 3) 10 minutes film made from the 30 gif’s, the signal film of les Sommets du cinéma d’animation scratched on 35mm film, Scratch-1 a mute video installation also made from the gif’s and presented at Cnetre Clark in January 2017, performance Scratch with two 16mm projectors presented at Cinémathèque québécoise in April 2017, and the installation Scratch 2- polyphony of flickers scratched on 35mm film and presented at Cinémathèque québécoise in May 2017.A second film was then made in 2018 but one bird sang not / mais un oiseau ne chantait pas. 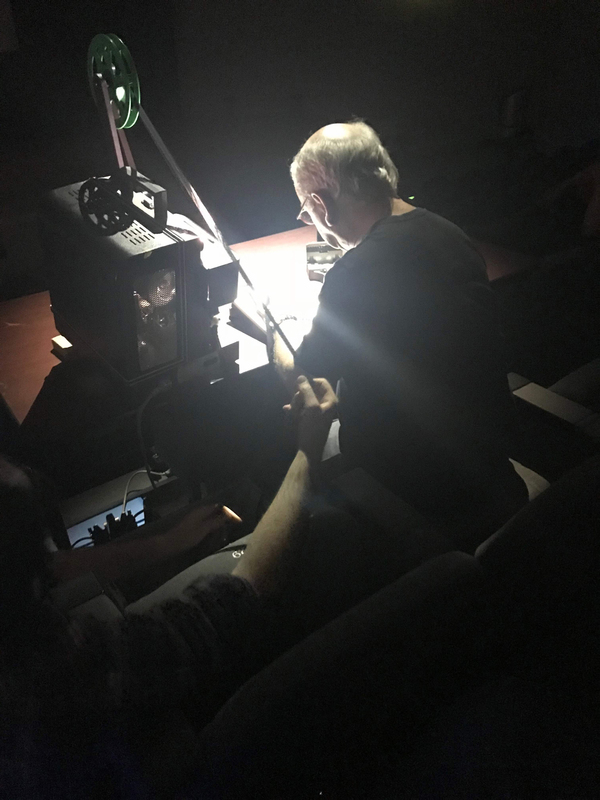 New performances with two 16mm projectors were presented, first on August 30 2018 during a Research-creation seminar at the University of Montreal, on October 14 2018 with Lori Freedman, at the auditorium of the Louvre Museum in Paris in October 2018 with Andrea Martignoni, at the Tokyo University of the Arts on December 20 2018 with Yuichi Matsumoto and at the Monstra Festival in Lisbon on March 28 2019, with Fernando Mota. 2 16 mm projectors, 2 tables (min. 75 cm x 150 cm), four chairs. The two projectors project on the same screen. The projectors have to be set in the center of the room facing the screen and I have to be able to move freely between the two projectors. This may cause problems and require special arrangements in theaters that are equipped with fixed seats. 2 assistants (one assistant for each projector). The function of the assistant is to make sure the film runs smoothly without making knots or breaking up. It includes the preparatory exercices, a video capture of the performance and a work in progress resulting from the perfomance. 1- May-June 2016 : series of thirty gif’s posted on my Facebook page. 2- July 2016 : Scratch, triptych 3, a ten minutes film made from the thirty gif’s with a music by Malcolm Goldstein. 3- November 2016 : signal film for the Summits of Animation Cinema 2016. 4- January 12 to February 11 2017 : the video installation Scratch-1 at the Clark Center in the Hors-Pages exhibition curated by the HB magazine, devoted to drawing. 5- April 6 2017 : the Scratch performance with musicians Malcolm Goldstein (violin) and John Heward (drums) in the Norman McLaren hall of Cinémathèque québécoise. 6- April 28 avril to June 4 2017 : the video installation Scratch-2, polyphony of fliskers, with musical fragments by Malcolm Goldstein and John Heward. 8- On 13 and 14 November 2017, during the Electro Acoustic Winds Symposium art University of Aveiro in Portugal, public rehearsal and performance Scratch with Lori Freedman. 9- On August 30 2018, during a research/creation seminar at University of Montreal, a two projectors performance with clarinet player Lori Freedman. 10- On October 14 2018, during the Fantasmagoria events at the Louvre Museum Auditorium in Paris, a two projectors performance with Andrea martignoni. 11- On December 20 2018, at the Tokyo University for the arts, a two projectors performance with Yuichi Matsumoto. This performance capture is quite explicit concerning the technical setup needed for this two projectors performance.